What are some uses of protista? What are some protist diseases? Like animals and plants, protists are in the eukaryote domain. It shows most kingdoms of life on Earth. Question: We say there are forms of life called protista, yet there’s no kingdom named protista. What does this mean? To help answer this question, let’s look at how another scientist diagrams much of the same data. Notice this next diagram only show eukarya. yellow: dozens of different kingdoms of life. Q: What domains of life are not shown on this second cladogram? Q: In what ways are the two different cladograms similar? In what way are they different? 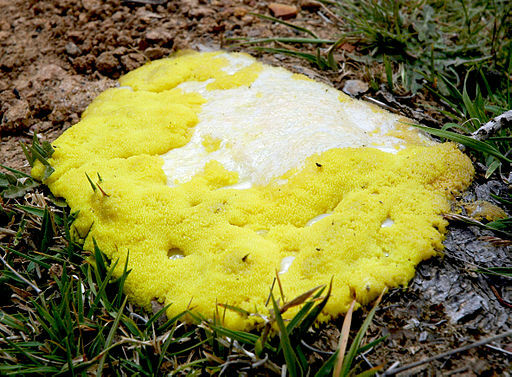 Q: Which yellow-colored kingdoms are the closest to plant life? We know about kingdoms of life such as animals, plants and fungus. We’ve heard about kingdoms of single celled organisms – bacteria and archaea. We can see them grouped together in the next diagram. Q: Based on the previous two cladograms, and this image, what can we now say about the protista kingdom? Protists aren’t a single kingdom. They are a super-kingdom, covering every kingdom of life on Earth that doesn’t fit into the more commonly known ones. They can be either unicellular or multicellular. They can be single-celled (microscopic), or their cells can connect to make colonies hundreds of feet long. Some species connect to create colonial organisms, tens of feet long. Can live in soil, on the bark of trees, in fresh water, and in salt water. Important because they produce a lot of oxygen. They form the base of aquatic food chains. These are not related to true fungi. cell membranes (plasma membranes), soft and flexible. They are able to move at some point in their lives, but once they connect to form a colony they stop moving. Can create water molds, downy mildews, and slime molds. Protists a a major part of the food chain in the oceans. Some protists are decomposers: These break down organic matter in the soil. Plant-like protists produce large amounts of oxygen gas. Most types of seaweed are protists, and many are edible. Good sources of nutrition. Some medicines have been made from molecules found in protists. Carrageenan is a common food ingredient, made from red algae. Parasites enter a host’s blood through the bite of an infected mosquito. The parasites infect the host’s red blood cells, causing fever, joint pain, anemia, and fatigue. Malaria is common in tropical and subtropical climates. It is one of the most common infectious diseases on the planet. It kills several million people each year, most of them children. A tremendous amount of research has gone in to developing a malaria vaccine. Currently, scientists have developed one weak vaccine, that offer 25% to 50% protection. Further improvements are expected. Members of the genus Trypanosoma are flagellate protozoa that cause sleeping sickness, which is common in Africa. They also cause Chagas disease, which is common in South America. The parasites are spread by insect vectors. The vector for Chagas disease is shown in Figure below. Trypanosoma parasites enter a person’s blood when the vector bites. Then they spread to other tissues and organs. The diseases may be fatal without medical treatment. The parasites enter the body through food or water that has been contaminated by feces of infected people or animals. The protozoa attach to the lining of the host’s small intestine, where they prevent the host from fully absorbing nutrients. They may also cause diarrhea, abdominal pain, and fever.